This is a bit of a nostalgia post, as we have had our shed for a while now. It was originally 'designed', by me, in 2014 and has attracted a few comments since. Mostly, because you can see it from quite a distance away. 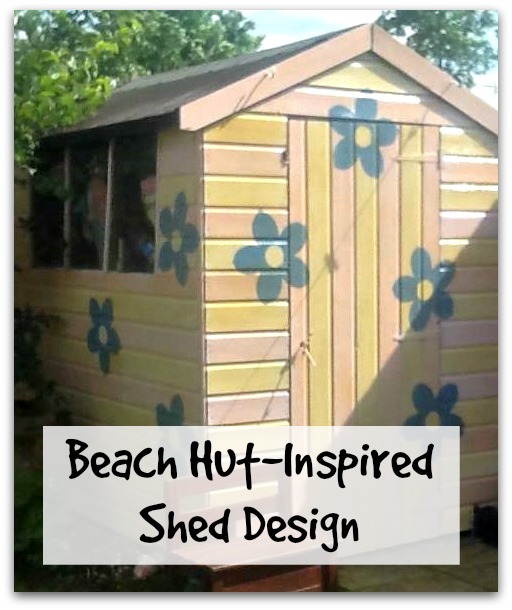 I had always wanted a beach hut-ispired shed and, a year later, I have no regrets about the bold statement it makes in the garden. Every now and then, I like to applaud The Husband's stoic ingenuity, often in the face of financial adversity. This somewhat psychedelic monument celebrates The Husband's dedication to some of my more bonkers design ideas and has so far gone largely unsung. 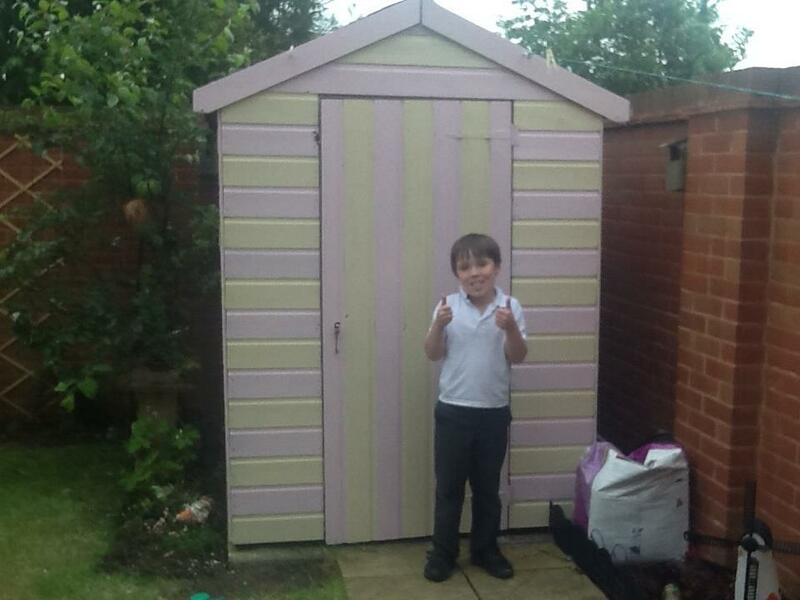 So,today, I give you... Our Garden Shed! It all began innocently enough. 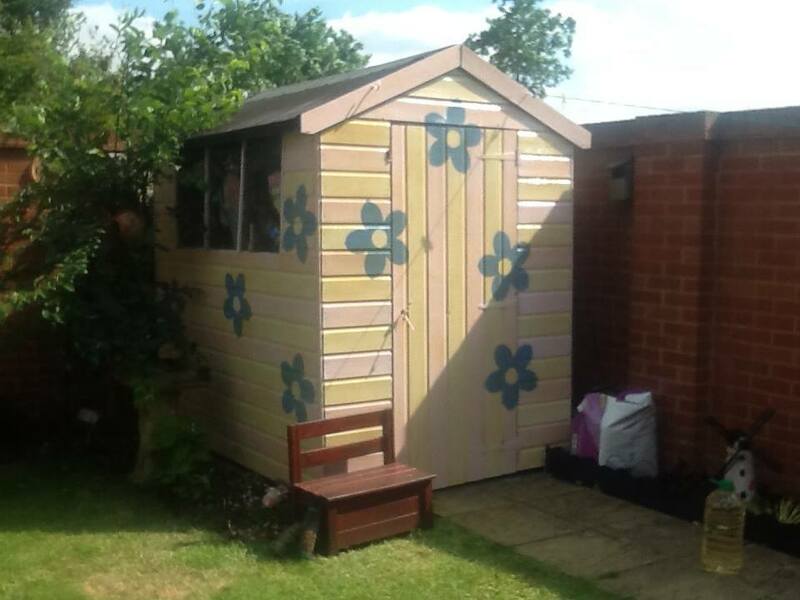 We had an ordinary brown shed, and had been putting off giving it a coat of woodstain for a number of years. 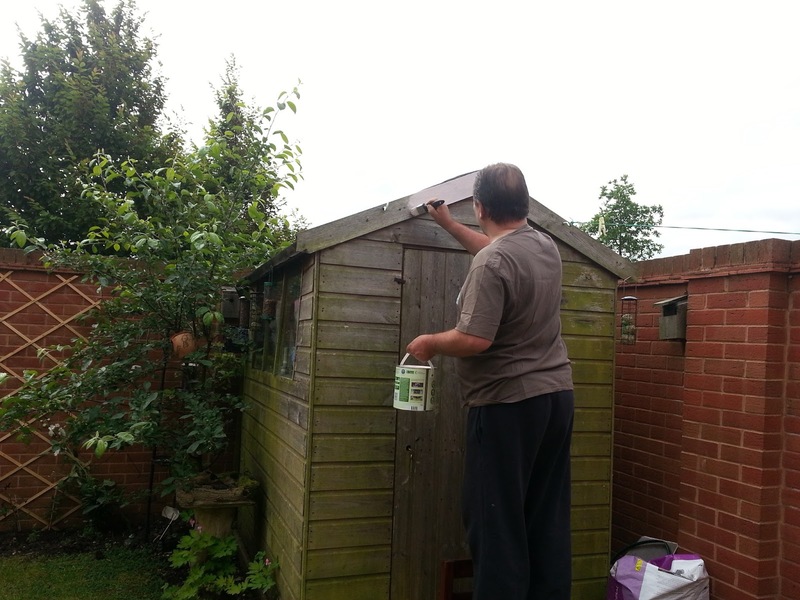 Every year, we would say; 'We really ought to get on with staining that shed, you know, it's not going to last forever!' but then we wouldn't. Eventually, it dawned on me. I realised, in a flash of inspiration, why we couldn't motivate ourselves to stain the shed. Simple, really; it was boring. Brown. Samey, dull, brown. Yawn. So, I mentioned to The Husband that perhaps we should consider painting it a colour. That was when it all went a bit crazy. You see, The Husband did something that was either really bold, or really, really stupid. He uttered those words every woman longs to hear. You... pick... the... colours! So I did. He may have instantly regretted it, but he dutifully set to work all the same. 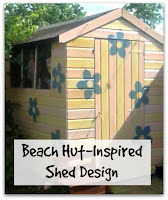 You see, what I had in mind, was to take advantage of the shed's built in stripes to create a really pretty beach hut look. Tasteful, yet unique. It was mesmerising watching the beach hut take shape. Every stripe painstakingly cut in, using an age-old mixture of patience and perplexity, it was a sight to behold. Eventually, stage one was complete. The Husband, however, decided this look was far too average for our garden, so he shimmied up the ladder to the loft and came down again, clutching an old wall light. Helpfully in the shape of a flower, this old light held the key to really making this shed our own. Several carefully drawn-round shapes later, the final phase was under way. I really like this colour blue, I was glad we found something to use it for! As you can see, it was a very hot day and I was pretty impressed with the grim determination with which The Husband carried on with his project. I actually had no idea he was this talented at painting. I fear he may soon regret revealing this new skill. 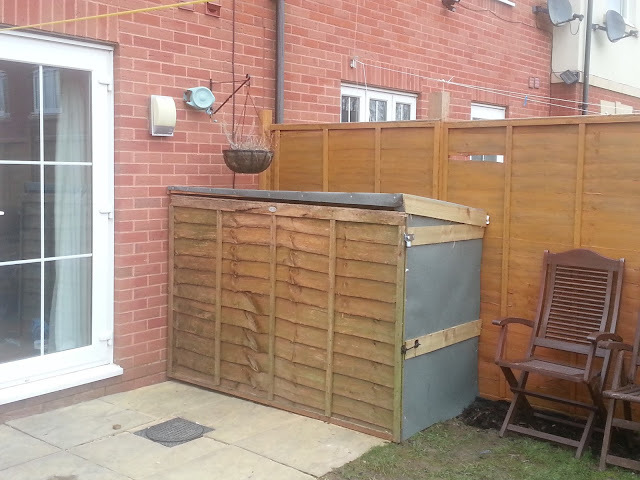 This is the bike shed he recently finished building and I've already got my thinking cap on! I love your shed :) so pretty ! 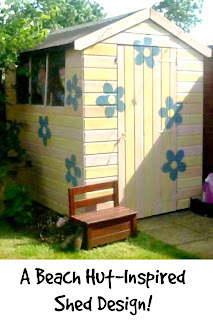 My friends and I have today been looking at photographs of sheds which women had decorated. We love them all so well done with yours. It stands out alright, you can see the blooming thing from Belgium but she's happy so job done. LOVE IT!! What a great idea! 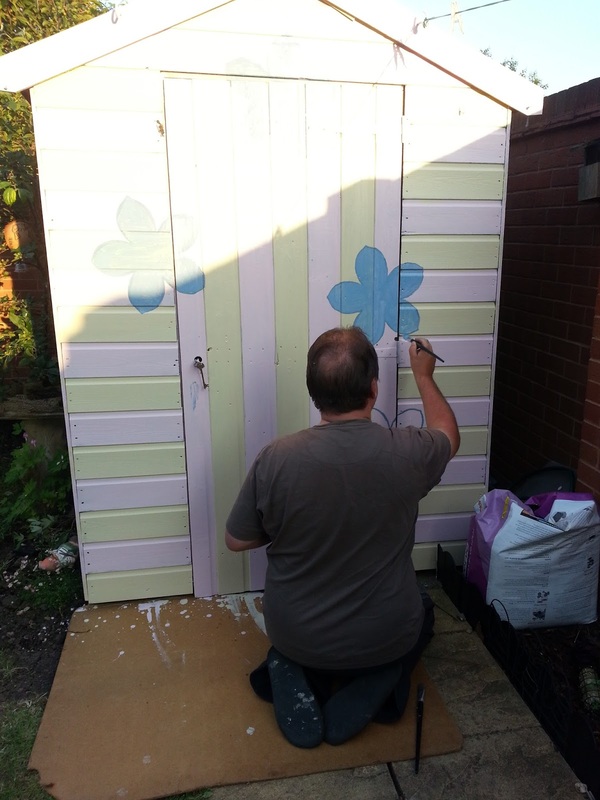 Our shed and rabbit hutch are in need of painting! so going to do this ... while the hubby is out or he'll go crazy! That is really fabulous! He did a very good job of it! Round here I would have had to paint it myself as my hubby isn't really practically minded! Luckily my nearly 14 year old son loves doing DIY and he gets a lot of things done with me! oh wow!! I love this!